After 20 years and after three hearings this year-The time has come! Join the Justice for Farmworkers Campaign as we come together in Albany on May 6th for Farmworker Albany Day and we make one last strong showing in the state capitol! 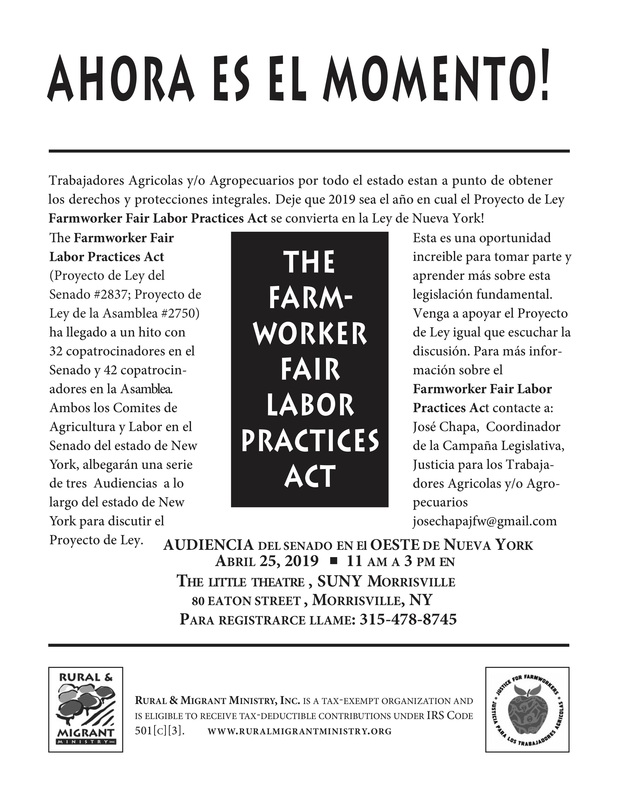 Farmworkers deserve the dignity and respect they were excluded from decades ago. By banding together we can will state: Enough is enough. 2019 is the year New York will respect ALL its workers! Después de 20 años y después de tres audiencias este año-El tiempo a llegado! We need your presence to let Senators know our community supports Justice for Farmworkers. The time is now! Contact Jose Chapa for more information. Bajar el volante en español aquí. Meals Available for $20, or Raise $100 and eat free! Join us for a festive celebration with networking, dinner and entertainment! In honor of Cesar Chavez Day--Join us for an afternoon of spirit, song and social justice featuring Latin Grammy Award Winners Flor de Toloache! This is a Free Event and Open to the Public!